Instead of trying out something exotic this week, the weather and general laziness amounting from a stressful week at work called for something much simpler. 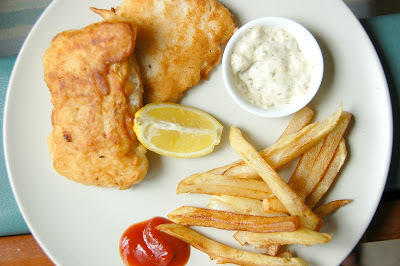 Any way, who doesn't love fish n' chips (apart from vegetarians and health conscious people)! Needless to say, I've never made them at home before and have relied primarily on the chippies down in Central and Stanley to get my biannual dose of proper fish n' chips in Hong Kong lol. Glad I tried it too, because even despite the mess that I've made in the kitchen while trying to whisk up the batter, they turned out to be pretty good. I made the fish in two batches; unfortunately the first turned out to be a bit soggy and not crispy at all because I didn't dry the fillets after defrosting them, and didn't coat them with that much batter. The second batch which I coated with a thicker version of the batter and fried for longer, was much much better. Just as it should be. The chips though, could've been less floppy too, but that's because they had to sit and wait while the fish was being done. So, lessons learned, and looking forward to trying it again at some point. Chop potatoes to make thick chips. Wash them, and pat dry them with a kitchen towel. Heat the oil. When it's hot, add the potatoes and fry them until they become slightly soft and golden. Toss them with a bit of salt (or a lot, if you prefer). Reserve until fish is ready. Whisk together 1.5 cups flour, salt, paprika, 1/4 cup beer, and 1/4 cup water, until they form a smooth pasty batter. It should be thick enough to coat a spoon lightly when you dip it in the batter. Dredge the fillets in the rest of the flour. Make sure they're fully coated; it will help to hold the batter on to the fish. Heat the oil in a frying pan. Dip the fillets in the batter. Shake them out a bit to make sure access batter comes off. Place them carefully in the frying pan, and fry each side until the fillet is golden brown and crisp! 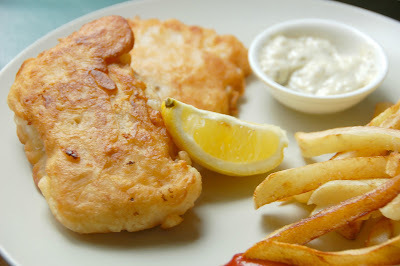 Serve with a slice of lemon, tartar sauce, ketchup if wanted, vinegar, and of course, a cold beer! Jaime Oliver recommends frying the first first, and then the chips in the same oil as the fish. Sounds good, but considering that I don't have an oven to keep things warm after cooking, best thing to do is to do it in the order mentioned above. I'd rather have colder chips that can be microwaved to heat up rather than cold fish that I prefer not to microwave.